Many snacks in market today are made from refined wheat flour as it is more appealing to tongue and tasty but at the same time unhealthy. 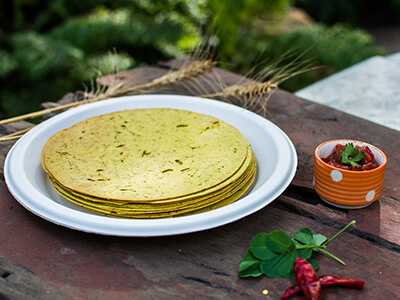 In contrast, Truweight Diet Khakhra has goodness of whole wheat & Fenugreek leaves. It has upto 50% less fat as compared to fried potato chips. It also has higher protein & fibre than potato chips. 1. Wheat is rich in magnesium, which helps synthesize more than 300 enzymes. They are involved in the body’s optimal use of insulin and glucose secretion. 2. Wheat contains betaine, which helps in in the prevention of chronic inflammation. 3. 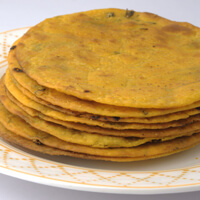 Dietary fibre present in khakhra keeps you feel full for longer and hence, it plays a major role in weight reduction, maintaining blood sugar levels, and good digestion. 4. Whole wheat is a good source of vitamin B, Vitamin E, magnesium, iron and fibre, as well as antioxidants. It contains micronutrients, which helps to reduce absorption of cholesterol from fatty foods. It also reduces body’s cholesterol production, especially bad cholesterol. 5. Insoluble fiber present in millets accelerates intestinal transit time, reduces the excessive secretion of bile acids, which can lead to gallstone formation, increase in insulin sensitivity. It also lowers the level of triglycerides. Fenugreek or methi is a rich sources of steroidal saponins and helps to prevent the absorption of cholesterol and triglycerides and hence reduces the cholesterol level. 6. Fenugreek contains galactomannan, a natural soluble fibre that slows down the rate of glucose absorption into the blood and also contains amino acids that are responsible for activating the production of insulin.